We plan for each team to play in at least 12 tournaments this season. Please note: We plan to register for the tournaments below, they are all currently tentative. We will have the schedule out and updated for you to see before the season starts. 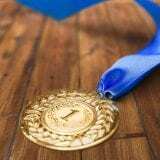 The ultimate award in team sports is a podium finish. Out-executing most or all other teams in a tournament is symbolic of team excellence, execution, and game-awareness. It is a signal that the coaches are on target with countless hours of lessons and strategies against the best the tournament had to offer. It is a signal that the players understood, were driven to execute the vision, and did just that. For each tournament with a podium finish, each coach and player will earn a team medal indicating first, second, or third place. We won’t win all the time, so we will value those moments when it all comes together. At the Colorado Royals, our sights are set on excellence, not perfection. Excellence will win games and it has a habit of spilling into other areas of our lives and multiplying our successes. Additionally, for each tournament, the players will vote for one (1) secret-ballot MVP.